Lucy Ann Lester Colvin, age 80, of Lake Jackson, Texas, passed away on September 24, 2018, after a lengthy battle with Alzheimer’s Disease. Lucy was born on April 12, 1938, in Beaumont, Texas, to Ned and Verna Jack Lester. The family relocated to the Brazosport area in the early 1940’s and were pioneers in the establishment of Lake Jackson. Lucy graduated from Brazosport High School in 1956 and from Baylor University in 1959. She married Rex Colvin in June of 1959 and began her teaching career at South Houston Elementary School. She and Rex returned to Lake Jackson in 1960 and she continued her teaching career at A. P. Beutel Elementary School until her retirement in 1979. 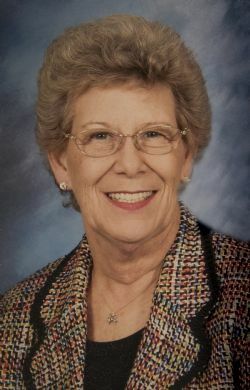 Lucy was a lifetime member of First Baptist Church of Lake Jackson. She served as an organist, preschool Sunday School teacher, and tutor in the KOOL Club after-school program for elementary age children. She was also a long-time member of the Daughters of the American Revolution, Colonial Dames, and founding member of the Lake Jackson Historical Museum. Lucy was preceded in death by her parents, Ned and Verna Jack Lester; her in-laws, William H. and Margie Colvin; nephew David Lester Moody and great-nephew Jonathan Unger. She is survived by her loving husband of 59 years, Rex; daughter Kay Wright and husband Rick; daughter Carol Sheehan and husband Mike; grandchildren Angela Styron (Aaron), Amy Wright, Meghan Prokop (Ross), and Brian Sheehan (Amy); great-grandchildren Camden and Carson Styron. Lucy is also survived by her sister Jane Moody (Roger) and sister-in-law Violet Heath (Billy) and numerous adoring nieces, nephews and other loving relatives. Services will be held on Friday, September 28, 2018, at First Baptist Church, 401 Yaupon, Lake Jackson, Texas. Visitation will begin at 10:00 a.m. with service following at 11:00 a.m. Final arrangements by the Turner Family at the Lakewood Funeral Chapel. Pallbearers will be Rick Wright, Mike Sheehan, Brian Sheehan, Aaron Styron, Ross Prokop, Roger Moody and Koehn Mailand. In lieu of flowers, memorials may be made to Brazoria County Gathering Place, P.O. Box 2050, Angleton, TX 77516 or A*Med Community Hospice, 600 E. Cedar, Angleton, TX 77515. Lucy will be missed by all who knew her as either family or friend. She enriched the lives of all she met, leaving an indelible mark on their hearts with her kindness and grace.